SAN JOSE, Calif. — Since 2000, when the first camera phone was introduced, the number of mobile users has quintupled. 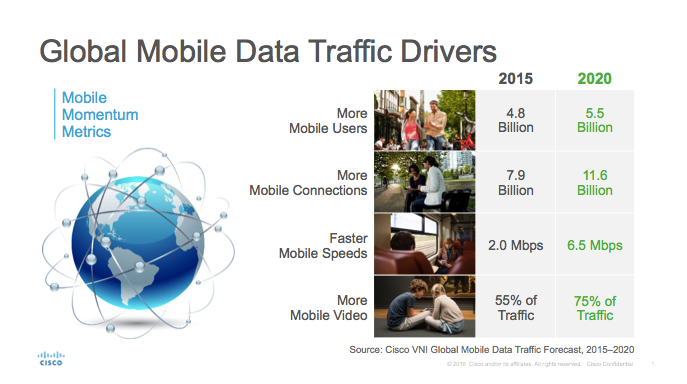 By 2020, there will be 5.5 billion mobile users, representing 70 percent of the global population, according to today’s release of the Cisco Visual Networking Index™ (VNI) Global Mobile Data Traffic Forecast (2015 to 2020). The adoption of mobile devices, increased mobile coverage, and demand for mobile content are driving user growth two times faster than the global population over the next five years. This surge of mobile users, smart devices, mobile video and 4G networks will increase mobile data traffic eight-fold over the next five years. Smart mobile devices and connections are projected to represent 72 percent of total mobile devices and connections by 2020—up from 36 percent in 2015. Smart devices are forecasted to generate 98 percent of mobile data traffic by 2020. From an individual device perspective, smartphones are dominating mobile traffic. They will account for 81 percent of total mobile traffic by 2020—up from 76 percent in 2015. The proliferation of mobile phones, including “phablets” (a hybrid blend of smartphone and tablet features), is increasing so rapidly that more people will have mobile phones (5.4 billion) than electricity (5.3 billion), running water (3.5 billion) and cars (2.8 billion) by 2020. Mobile video will have the highest growth rate of any mobile application. Consumer and business users’ demand for higher video resolution, more bandwidth, and processing speed will increase the use of 4G connected devices. 4G connectivity share is projected to surpass 2G by 2018 and 3G by 2020. 4G will represent more than 70 percent of all mobile traffic, and 4G connections will generate nearly six times more traffic per month than non-4G connections by 2020. Global mobile data traffic will reach 30.6 exabytes per month—up from 3.7 exabytes in 2015. Annual global mobile data traffic will reach 366.8 exabytes—up from 44.2 exabytes in 2015. 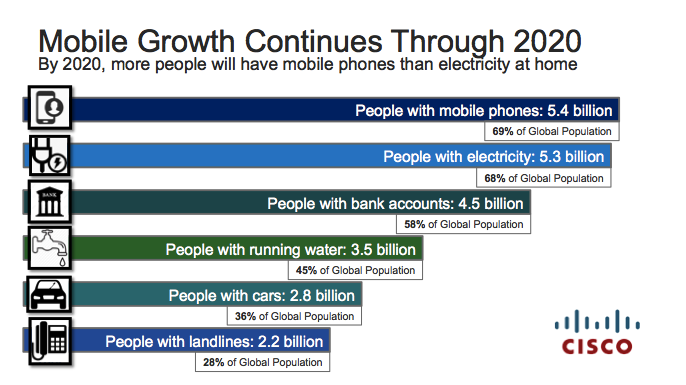 120X more than all global mobile traffic generated just 10 years ago in 2010. 81 trillion images (e.g., MMS or Instagram)—28 daily images per person on earth for a year. 7 trillion video clips (e.g., YouTube)—more than 2.5 daily video clips per person on earth for a year. 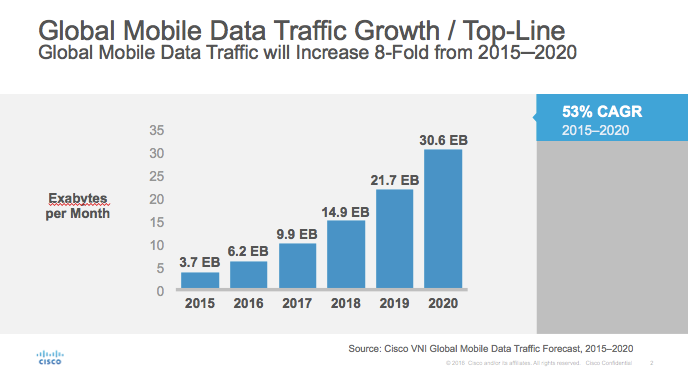 From 2015 to 2020, global mobile data traffic will grow two times faster than global fixed IP traffic. In 2015, 51 percent of total mobile data traffic was offloaded; by 2020, 55 percent of total mobile data traffic will be offloaded. By 2020, over 75 percent of the world’s mobile data traffic will be video. There will be 11.6 billion mobile-ready devices/connections—including 8.5 billion personal mobile devices and 3.1 billion M2M connections –up from 7.9 billion total mobile-ready devices and M2M connections in 2015. Globally, 67 percent of mobile devices/connections will be ‘smart’ by 2020—up from 36 percent in 2015. Globally, 98 percent of mobile data traffic will come from ‘smart’ devices/connections by 2020—up from 89 percent in 2015. Smartphones, laptops, and tablets will drive about 92 percent of global mobile data traffic by 2020—down from 94 percent in 2015. M2M traffic will represent 7 percent of global mobile data traffic by 2020—up from 3 percent in 2015; while basic handsets will account for 1 percent of global mobile data traffic by 2020—down from 3 percent in 2015. 66 percent of mobile devices/connections will be IPv6-capable—up from 36 percent in 2015. IPv6 traffic will be 54 percent of total mobile data traffic—up from 13 percent in 2015. M2M refers to applications that enable wireless and wired systems to communicate with other devices of the same ability (e.g., GPS/navigation, asset tracking, utility meters, security/surveillance video, healthcare monitoring, et al.). Wearable devices can be worn (e.g., smart watches and health monitors) and communicate to the network either directly via embedded cellular connectivity or through another device (primarily a smartphone) via Bluetooth, Wi-Fi, etc. Wearable devices are a subset of the M2M category in the forecast. By 2020, M2M connections will represent 26.4 percent of mobile-connected devices—up from 7.7 percent in 2015. By 2020, M2M connections will generate 6.7 percent of total mobile traffic—up from 2.7 percent in 2015. Global wearables will grow six-fold from 2015 to 2020. By 2020, there will be more than 600 million wearable devices in use, up from nearly 97 million in 2015. Average global mobile network speeds will increase 3.2 fold from 2015 (2.0 Mbps) to 2020 (6.5 Mbps). Global 4G adoption is the primary catalyst for mobile speed improvements. 4G connections will account for 40.5 percent of all mobile connections–up from 13.7 percent in 2015). 3G connections will account for 38.7 percent of all mobile connections—up from 33.7 percent in 2015. 2G connections will account for 13.5 percent all mobile connections—down from 52.3 percent in 2015. 4G traffic will grow 13-fold from 2015 to 2020. By 2020, 4G connections will account for 72 percent of total mobile data traffic—up from 47 percent of total mobile data traffic in 2015. Globally, total Wi-Fi hotspots, including home spots, will grow 7X from 2015 (64 million) to 2020 (432 million). Globally, home spots will grow from 57 million (2015) to 423 million (2020). In 2015, monthly Wi-Fi offload traffic (3.9 exabytes) exceeded monthly mobile/cellular traffic (3.7 exabytes) for the first time. By 2020, 38.1 exabytes Wi-Fi offload traffic will be generated each month, continuing to exceed projected monthly mobile/cellular traffic (30.6 exabytes). Given the growth and mobile networking role of Wi-Fi technologies, this year’s study again compares VoWi-Fi to other mobile voice services. Previous VoWi-Fi offerings had limitations that affected adoption and end-user experiences. Today’s carrier-grade VoWi-Fi services can be delivered to non-SIM devices, such as Wi-Fi-only tablets. By 2016, VoWi-Fi will exceed VoLTE in the number of minutes used per year. By 2018, VoWi-Fi will exceed VoIP in the number of minutes of used per year. By 2020, VoWi-Fi minutes of use will account for half – 53 percent – of all mobile IP voice traffic. By 2020, the number of Wi-Fi-capable tablets and PCs (1.7 billion) will be more than three times the number of cellular-capable tablets and PCs (548 million). The world’s projected population by 2020 will be 7.8 billion people (source: United Nations). Smart devices are defined as connections with advanced computing/multimedia capabilities and a minimum of 3G connectivity.